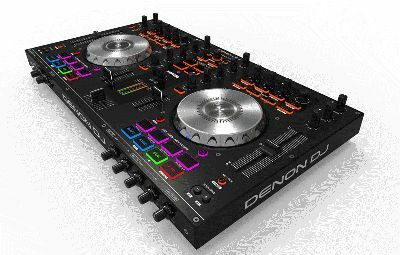 Denon DJ (denondj.com), a leading manufacturer of premium DJ products and solutions, announced that shipments of its brand-new MC4000 DJ controller have begun. Featuring a sleek new design, all metal construction and inviting appearance, the MC4000 continues Denon DJ’s reputation for innovative features, dependability, unrivaled sound quality and peerless value. The all-new MC4000 is a 2-deck Serato MIDI controller for the professional DJ, wrapping in-demand audio manipulation tools in a robust steel chassis. In addition to precision touch-activated jog wheels, performers get access to dedicated hot cue and sample pads for on-the-fly creativity. Long-throw 100mm pitch faders and an intuitive control layout deliver natural operation when balancing complex set elements. Known for their emphasis on sound quality, Denon DJ includes a premium 24-bit audio output path for noticeably clearer mixes. Denon DJ’s highly regarded dual microphone inputs are complemented by a studio-grade echo effect, and “ducking” feature—effortlessly moving vocals to the top of the mix without riding faders. The MC4000 includes Serato DJ Intro and is natively supported by Serato DJ, Virtual DJ 8, and Algoriddim djay PRO. A Traktor Pro 2 mapping is also available on the MC4000 product page.